George Dunlap is the District 3 Representative on the Mecklenburg County Commission. George serves as a member of the Audit Committee and the Economic Development Committee. George previously served as Chairman of the Efficient and Effective Government committee, Health and Human Services, and as a member of the manager’s compensation committee. Additionally, he served as the Commission’s representative on the WTVI public Television Board, liaison to the Volunteer Fire Commission and as a member of the Public Safety Committee. 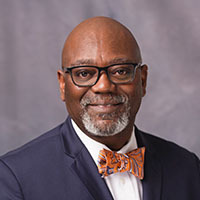 George was re-elected to the commission for a forth term, after having served almost 14 years as the District 3 representative on the Charlotte-Mecklenburg School Board. As a School Board Member, he served as chairman of the Safety Committee, a member of the Policy Committee, a member of the Finance, Capital and Budgeting Committee and as a member of the Charlotte-Mecklenburg Schools Education Foundation and was the chairman of the Audit committee. George is a former DARE Officer with the Charlotte-Mecklenburg Police Department, where he had been employed for 27 years prior to his retirement in June 2005. More than 17 of those years have been spent working with children. George is a member of the National Board of Directors for the National Association of County Officials (NACO), a member of the North Carolina Association of County Commissioners (NCACC) and a member of the Board of Directors for Cardinal Innovations. George was a volunteer with the Charlotte-Mecklenburg Police Athletic League (PAL) and served as director of the PAL Summer Enrichment Program for underprivileged children during the summer for 10 years. He attends Saint Paul Baptist Church, a 5000 member congregation, where he serves as Chairman of the Board of Directors, member of the Visitors Ministry, the Hymn Choir and is a Deacon emeritus. Additionally, George served as Chairman of the Centralina Economic Development Committee, which serves nine Counties, including Mecklenburg County, serves as a member of the Communities in Schools Board of Directors and was a Delegate and Executive Board Member of the Centralina Council of Governments. George has served and continues to serve on a number of other local boards and commissions. George is a lifelong resident of Mecklenburg County, born and reared in Pineville. He attended Charlotte-Mecklenburg Schools and is a 1974 graduate of South Mecklenburg High School. After finishing high school, he entered the United States Marine Corps (USMC), where he received meritorious promotions to the rank of PFC and Lance Corporal. He obtained the rank of Sergeant by the end of his enlistment in 1976. George returned to Charlotte and served as a counselor for the National conference of Christians and Jews, now the National Council of Community and Justice. In 1978, he was employed by the Charlotte-Mecklenburg Police Department, where he served until his retirement in June of 2005. George received his Masters Degree of Public Administration from the University of North Carolina at Charlotte in 2003. He received a Bachelor of Science Degree in Criminal Justice from the University of North Carolina at Charlotte in 1991. In 1983, George received an Associate Degree in Correctional Science from Central Piedmont Community College and in 1979; he received an Associate Degree in Law Enforcement. He was a spring of 1992 Fellow in the North Carolina Institute of Political Leadership and a Fellow in the Broad Institute of Governance. George has long been interested in public service and politics. When attending South Mecklenburg High School, he was elected to student council and served as president of the Bus Divers club. In 2004, he has served as a campaign manager and as GOTV Chair for the Black Political Caucus. George is the recipient of many awards and recognitions, among them is the Richard H. Hagemeyer Award. The Highest Honor given to graduates of Central Piedmont Community College.